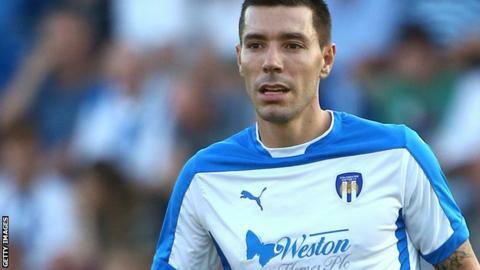 Darren Ambrose scored on his Colchester United debut to deny Blackpool victory on their return to England's third tier after eight years. Mark Cullen's tap-in finish from Gavin Massey's low cross put the Seasiders ahead, only for Alex Gilbey to level with a volley. Cullen added a second in first-half injury time, firing into the net through a crowded area. But Massey set Ambrose up to equalise before going close to finding a winner. Match ends, Colchester United 2, Blackpool 2. Second Half ends, Colchester United 2, Blackpool 2. Alex Wynter (Colchester United) wins a free kick in the attacking half. Attempt missed. Gavin Massey (Colchester United) right footed shot from outside the box is just a bit too high. Corner, Blackpool. Conceded by Kane Vincent-Young. Corner, Colchester United. Conceded by David Ferguson. Substitution, Colchester United. Dion Sembie-Ferris replaces Darren Ambrose. Attempt missed. Alex Wynter (Colchester United) header from the centre of the box is close, but misses to the right. Gavin Massey (Colchester United) wins a free kick on the right wing. Jim McAlister (Blackpool) wins a free kick on the right wing. Substitution, Colchester United. Kane Vincent-Young replaces Matthew Briggs. Attempt missed. Brad Potts (Blackpool) right footed shot from outside the box misses to the left. Substitution, Blackpool. Kyle Letheren replaces Colin Doyle because of an injury. Delay in match Colin Doyle (Blackpool) because of an injury. Attempt saved. Gavin Massey (Colchester United) right footed shot from the centre of the box is saved in the centre of the goal. Attempt blocked. Darren Ambrose (Colchester United) right footed shot from long range on the left is blocked. Emmerson Boyce (Blackpool) is shown the yellow card for a bad foul. Attempt saved. George Moncur (Colchester United) left footed shot from the centre of the box is saved in the bottom left corner. Corner, Blackpool. Conceded by Tom Eastman. Attempt missed. Brad Potts (Blackpool) right footed shot from outside the box is close, but misses to the right. Substitution, Blackpool. Kwame Thomas replaces Bright Samuel because of an injury.